Note: This event was previously scheduled for October 30th, 2018. It has been postponed and rescheduled for January 16th, 2019. You can read more about this postponement here. The Pittsburgh Project's Servant Leader Celebration in 2017 was such a resounding success! All because of our many loyal supporters who sponsored, attended, and helped make the evening a beautiful community event. 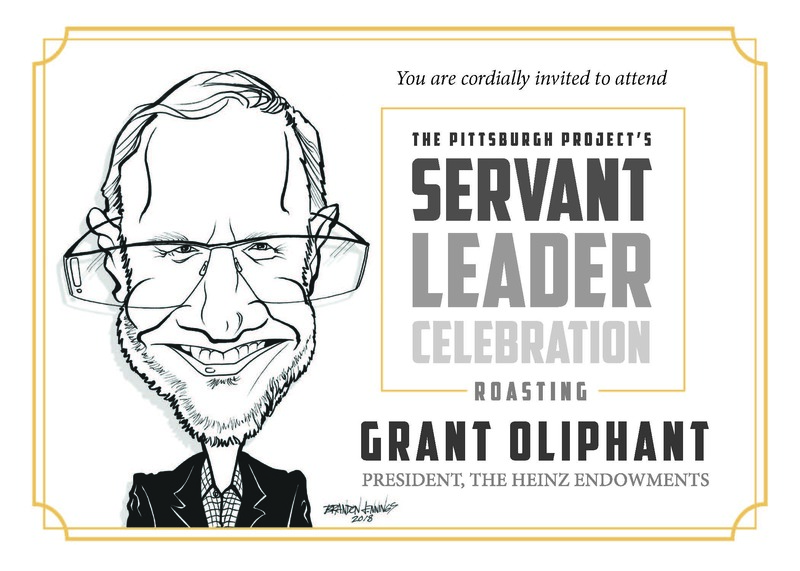 This year, we will build on that stunning success with an especially wonderful event – a Roast of Grant Oliphant, President of The Heinz Endowments and a true champion for Pittsburgh. Grant's Roast will be a Community Celebration of Servant Leadership at The Downtown Fairmont on January 16th, 2019 starting with a VIP Reception at 5:30 p.m. All proceeds from the event will go directly to The Pittsburgh Project, enabling and empowering our continued mission of "developing servant leaders" and "upholding the dignity of vulnerable homeowners." Co-Chairs for the event are: Scott and Susan Lammie, Chief Financial Officer, UPMC Health Plan and Sr. Vice President, UPMC Insurance Services Division and Charles "Chip" and Carol Burke, Chairman, The Grable Foundation. • Kate R. Dewey, Senior Advisor, Cohen & Grigsby, P.C. We hope you will join us in honoring Grant—his two plus decades of service to many key constituencies have been transformational for Pittsburgh. For sponsorship opportunities please contact Wayne Younger at wyounger@pittsburghproject.org or 412-321-1678, ext. 540.